In an unexpected turn of events, a write-in candidate has beat out a longtime councilman for a seat on the Vernon City Council. Leticia Lopez, 32, made Vernon history April 12 when she beat out Mayor W. Michael McCormick by two votes. City Clerk Maria E. Ayala and a four-member election canvassing board declared Lopez the winner Monday following a final canvass of 7 outstanding ballots. Lopez received 21 votes to McCormick’s 14. A second write-in candidate, David J. Ybarra, received one vote. McCormick served on the council for 42 years. It was a big departure from past elections where candidates often ran unopposed. On Tuesday, Lopez joined Councilmembers Melissa Ybarra, Luz Martinez and newly appointed Mayor Pro Tem Yvette Woodruff-Perez and Mayor William “Bill” Davis behind the dais and will serve a five-year term. Woodruff-Perez is the first woman to serve as Vernon’s Mayor Pro Tem. Lopez, a family advocate assigned to the Human Services Association’s Head Start program, told EGP she ultimately decided to run to be an advocate at home. Lopez has a Bachelors Degree in Human Development from Cal State Long Beach and is currently working on her masters at Pacific Oaks College. Lopez lived in nearby Huntington Park before moving into a home adjacent to Vernon City Hall two years ago. The mother of two says she and her husband have kept an eye on the issues brought on by the now shuttered Exide plant in Vernon. “[Exide] has impacted my life,” she said. “I don’t let my children play in the backyard,” she pointed out. Lopez plans to monitor state funds coming in to help expedite the cleanup and says she hopes to join Ybarra’s efforts to make the city itself more family-friendly, perhaps by opening a public park. Lopez told EGP she is somewhat familiar with the industrial city’s dark past, but has seen the city become more transparent in recent years. “I’m coming with a fresh, positive outlook and I want a clear mind free of negativity so that I make the best decisions for my city now,” she said adamantly. Noting the number of fresh faces on the council and new department heads, Fandino suggested the city consider holding a retreat to discuss their vision for Vernon. “All these tremendous changes are very healthy,” he told EGP. Van de Kamp believes the biggest issue facing the new council is how to handle pension liabilities and still balance the budget. In an often-repeated refrain, he said councilmembers “need to ask questions. They must make sure the city is on its path to meet the needs of the businesses and residents,” he explained. While the total number of votes cast might not generate much celebration outside Vernon, Ayala said she is proud of Vernon’s 51 percent voter turnout. The city has been working on increasing its electorate, going as far as building new housing to increase the voter pool. This election marked the first time those new voters had a chance to cast a ballot. Yet, while the city’s population has doubled, voter registrations only increased by six since the last election. Van de Kamp told EGP he has not seen as many registered voters from the new Vernon Village Park as he would like. “Looking ahead, we must continue to do outreach with the electorate,” Ayala acknowledged. Correction 12:50 p.m. April 28, 2016 An earlier version of this story mistakenly identified Yvette Woodruff-Perez as Lyvette. The article also inaccurately stated that 36 out of the 72 registered voters reflected the voter turnout when in fact it related to the ballots counted. Two votes may make the difference in Vernon’s latest election, according to a preliminary vote count that has a write-in candidate leading a longtime sitting councilman. Leticia Lopez received 15 votes, while Mayor W. Michael McCormick received 13 votes, according to the unofficial vote tally. A second write-in candidate, David J. Ibarra, received one vote during Tuesday’s city council race. Vernon uses a vote-by-mail format for all its elections, and according to the city clerk’s office, 33 of 72 potential vote-by-mail ballots were received by Tuesday, Election Day. One ballot was disallowed because it was missing the voter signature and three ballots are pending voter signature verification. If Lopez is declared the winner, four of the five Vernon council members will be Latina, a first in the industrial city’s history. A final vote canvass of all outstanding and pending ballots, including those that were postmarked by the April 12 deadline, will be conducted on Monday, April 18 at 1 p.m.
McCormick has served on Vernon’s City Council since 1974. A public administration consultant who most recently served as the executive director of the San Bernardino International Airport Authority has been appointed Vernon’s Interim City Administrator, the city announced Thursday. The appointment comes on the heels of last week’s sudden departure of former City Administrator Mark C. Whitworth. According too the city, the Vernon City Council appointed A.J. Wilson to lead the city while an executive search firm and staff continue their search for a permanent replacement for Whitworth. Whitworth retired Dec. 28 after more than 26 years of public service in Vernon, nearly five months earlier than he previously announced. Wilson is the president of Wilson Communications, LLC, a management service-consulting firm. He is the former deputy mayor of St. Louis, Missouri and former city manager of the cities of Pomona, Santa Ana, Kansas City, Portland (Maine) and interim city manager of Norco. 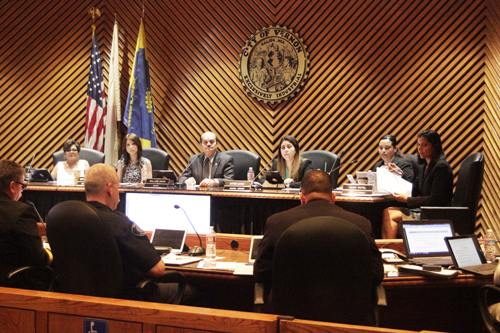 Council members are expected to interview prospective candidates in the coming weeks. As the city of Vernon continues its search for a new city administrator and two additional department heads, staff is recommending the city council take steps to make the industrial city more attractive to potential candidates for top administrative positions. City Administrator Mark Whitworth will retire in a few months and staff has asked the City Council to approve a new higher-tiered retiree medical benefit program for city executives. Councilwoman Melissa Ybarra, however, was not comfortable with the recommendation, strongly telling staff she needs more information before she can decide whether their proposal warrants consideration. “Why are we covering their spouses” for example, she asked. Interim Human Resource Director Lisette Grizzelle said the proposed changes are meant to make Vernon more attractive to those who may need the extra incentive to work in the city. She said her department surveyed nearby cities and found most provide similar benefits. For years, Vernon was synonymous with the political corruption that swept the southeast communities. 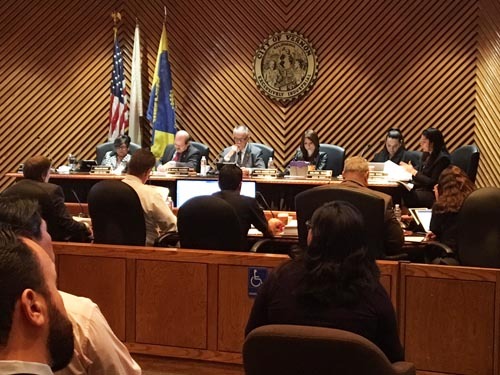 Previous city officials were accused of bulking up their benefits packages by receiving compensation for several positions not listed on the city’s pay schedule, leaving current councilmembers leery of repeating the same mistake. To this day, former Vernon city administrator Bruce Malkenhorst is the highest paid retiree under the California Public Employees’ Retirement System (CALPERS). He was at one point receiving a monthly pension of over $44,000, which CALPERS eventually reduced to $10,000 a month on grounds that his pay while with the city had been improperly inflated. The pension system is now seeking to get back $3.4 million in overpayments to Malkenhorst. The city is no longer facing a budget deficit, but in Vernon, like many other cities and the state, unfunded pensions are a looming concern. To that end, Ybarra wanted clarification on where the money for the new higher benefits would come from, but staff was unable to give the council a direct answer on a revenue source. Ybarra felt city staff was leaning toward an “approve this and we’ll find the money down the line,” scenario. “So, you’re asking us to approve this but we don’t know how we will fund it yet,” said Ybarra in disbelief. “I don’t want to approve something and then have to find the funding later,” she said. The council moved to table discussion until city staff can provide more information on a funding source and timeline. The council also discussed whether to extend Vernon’s independent reform monitor, former Attorney General and Los Angeles District Attorney John Van de Kamp’s contract: He has served in the position for four years. As independent reform monitor, Van De Kamp’s job was to oversee Vernon’s implementation of 150 good governance reforms brokered by Sen. Kevin de Leon as part of a 2011 deal to keep the State Legislature from passing a bill that would have disincorporated the city amid charges of misappropriation of funds, voter fraud and excessive executive salaries. “Having fulfilled the reforms we need to close the book on that section,” Whitworth advised the council during its Dec. 15 meeting. He recommended that Van de Kamp’s contract be extended one year under the new title of special advisor. Whitworth’s concern is that the current title “inaccurately” gives people outside the city the impression Vernon’s reform process is not finished. Vernon is a new city, Whitworth told staff when he announced his retirement earlier this month. “The challenges that faced Vernon five years ago were substantial, ending the city’s decades long practice of ‘running things the way they’ve always been run’ and ‘doing things they way they’ve always been done,’” he said. Van de Kamp, noting there are two new members on the council, an election in April and the search for a new city administrator and the directors of public works and human resources underway, countered that the city still needs an independent overseer. Marisa Olguin of the Vernon Chamber of Commerce agreed. She told the council that the city still faces challenges, including fulfilling PERS funding obligations, recently restructured debt and providing services to its 100 or so new residents. “Healthy governance is ongoing and must be maintained now more than ever as we’re going through this transition,” she said. “I think the key word to what Mr. Van de Kamp and his team brings is independence,” she added. If a title change is needed, how about “independent healthy governance advisor,” she suggested. His role represents continuity and good governance, transparency, oversight, and a smooth transition, she said. It doesn’t communicate there’s reason for doubt or something to be concerned about, she added. “It communicates that the Vernon Council takes its role seriously and that we’re taking steps to continue our healthy self-governance,” Olguin said. Ybarra told EGP the next city administrator needs to have the experience, must be ethical that will be instrumental in continuing the good governance. In the meantime, the council voted to delay its decision on Van de Kamp’s position until the next council meeting. For years, election of city office holders has come down to ballots cast by as few as two-dozen registered voters in Vernon, but with the recent doubling of the city’s residential population that could change. The city hopes to increase Vernon’s current pool of 63 registered voters by reaching out to people living in the recently opened Vernon Village Park development, and will hold an informational meeting there Nov. 18 to explain how elections work in the city. While Vernon has yet to see any new voter registrations since the housing project opened, “we are hoping that will soon change,” City Clerk Maria E. Ayala told EGP. Ayala said her office is hosting the meeting and that staff will explain Vernon’s voting process. They will also be armed with voter registration and change of address forms to make the process more convenient for residents. Vernon elections are conducted by mail-in-ballot – meaning there are no polling places or voting booths. While vote-by-mail ballots are not new, the “practice may be completely different to what new residents are used to,” Ayala said. The city clerk said her office has also compiled and distributed Vernon’s first resident information pamphlet containing contact information for city departments and important meeting dates to encourage residents to get involved in the city. The Nov. 18 meeting is open to all city residents – even if they are already registered to vote in L.A. County – and Spanish translation will be available. The meeting will be held at the Vernon Village Community Room located at 4675 E. 52nd Drive. The city’s next election is scheduled for April 12, when Mayor W. Michael McCormick’s term expires. For the first time in Vernon history, women will soon be the majority on the City Council. On Tuesday, voters elected Yvette Woodruff-Perez to succeed Councilman Richard Maisano who did not seek reelection. Woodruff-Perez defeated Dennis Roberts 21 to 13, according to the unofficial election results. Thirty-five of the city’s 66 registered voters returned their vote-by-mail ballots, according to the city clerk’s office. One of the ballots was returned blank and has not yet been canvassed, said city officials. The highly industrial city is home to 1,800 businesses, which include rendering plants and manufacturers. Since being founded in 1905, the city of Vernon has only had three female councilmembers: Woodruff-Perez becomes the fourth. She will join Melissa Ybarra, elected during a recent special election to fill the seat left vacant by the death of her father Michael A. Ybarra, and Luz Martinez who ran unopposed in her last election bid. Voters also approved two measures on the ballot. Measure O will amend the city charter to clarify that during an election with multiple seats up for grabs, seats with unexpired terms will only be filled after the winners of all the full-term seats are decided. Those seats will go to the candidate with the next subsequent highest number of votes. Measure P will allow the city council to fix the duties, tenure and compensation of officers by any means it deems appropriate. Woodruff-Perez will be sworn-in during Vernon’s next city council meeting on Tuesday, April 21. The Vernon City Council welcomed a new member Tuesday. 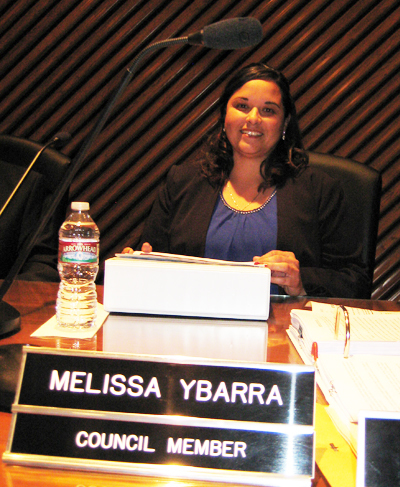 Melissa Ybarra took the oath of office Tuesday; she will fill out the remainder of the term left vacant by the unexpected death of her father, Michael A. Ybarra in September. Ther term expires in 2017. Ybarra, who ran unopposed, was elected Feb. 17, becoming the fourth member of the Ybarra family to serve in elected office in the City of Vernon since the 1930s. 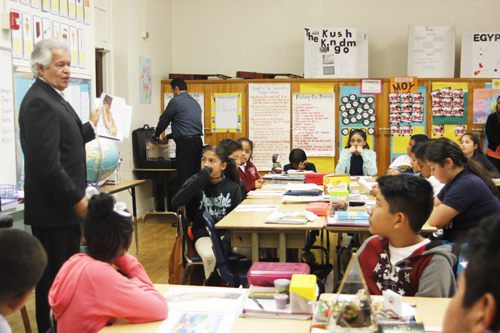 “I plan on making a difference in the community that I have grown up in,” she said. 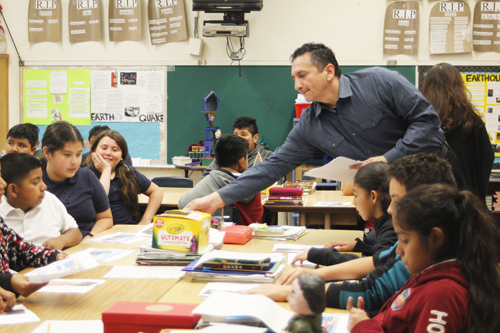 “I plan on embracing some of the characteristics that my father, Michael Ybarra, had. I plan on serving this seat with honesty and integrity. I plan on questioning all that I do not understand,” she added.